Enhance your home with a new aluminium patio door. 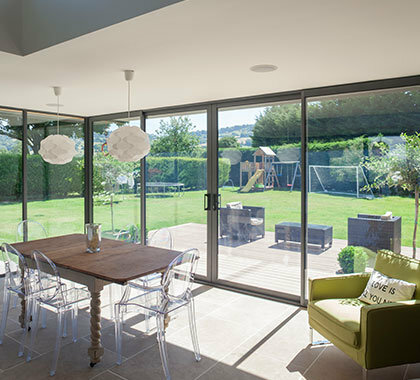 Whether you’re looking for a brand new aluminium patio door to provide better access to your garden, or you’re looking for a replacement door, you’ll be amazed at how different our stunning aluminium patio range is from the other doors on the market. The Alitherm Plus range of residential aluminium doors gives a high performing, robust domestic door at an affordable cost. It features adjustable hinges and lock keeps ensuring your door is completely adjustable and secure for any application. This patio door adds eye-catching impact to the exterior of your home. The outward appearance focuses on a stunning glass area, highlighted by bold aluminium section styles with clean aesthetic lines that work in harmony with the character of any home. 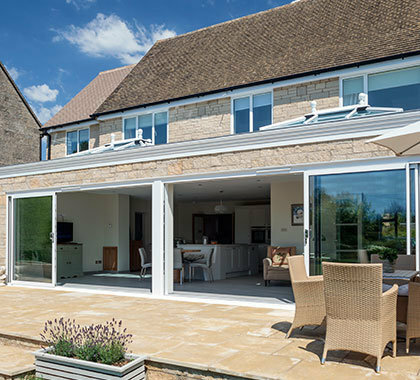 This versatile, single track, residential sliding door system provides a highly attractive, slim-line sliding door that has all the advantages of modern thermal break profiles to keep the heat in. It offers the option of 2 or 4 pane doors to suit any application. The 2-pane mono track options provide a single opening sash on either the left hand or right hand side. The 4-pane option allows for two operating sashes in the centre and fixed panels on the outside.